Ever wonder how it feels to be an astronaut? 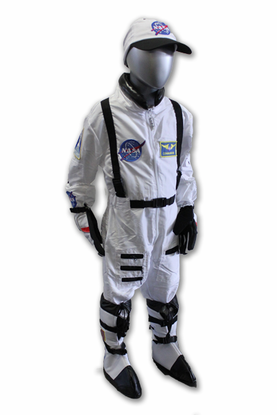 This astronaut space Flight suit is beautifully crafted and boasts that real NASA feel. Show your little astronaut how much you care, and don't forget the helmet completing the set. NASA hat included. Gloves and boots sold separately. Available in orange. Sizes are taken from the back of the neck to the floor. Size Length 18 mn = 26" 2/3 = 31" 4/6 = 38" 6/8 = 40" 8/10 = 43" 12/14 = 48"